A mainstay of jazz, brushes afford the drummer a softer-sounding alternative to sticks that's generally called on for pieces at the quieter end of the compositional spectrum - ie, ballads. They also appear with some regularity in folk and other 'acoustic' styles, where the drums often need to take more of a back seat than they ever would in rock and pop. The brush itself is nothing more than a fanned-out sheaf of stiff wires mounted in a handle. It can be used like a stick - albeit a decidedly bendy one - striking the drums and cymbals with the body or tip, or scraped on the snare drum head in a regular, repetitive motion, generating the constant whispery backdrop of noise that you likely associate with brushes, over which a riding pattern can be floated with the right hand on the snare or ride cymbal. While brushes probably aren't something you're going to find yourself programming in your patterns with any frequency, when the utmost in percussive delicacy is required, they can be just the ticket. In this tutorial, we'll show you the basics of putting your brushed virtual drum kit to good use in both backbeat and jazz-style contexts. Step 1: Virtual drum kits with full sets of brushed articulations aren't common, but Toontrack's Jazz EZX for EZdrummer 2 is a fantastic, affordable option. First, let's hear the difference in sound between brushes and sticks playing regular strokes. Here's a backbeat groove, triggering Jazz EZX's Basic preset, which uses sticks. Step 2: And here's the same groove again, this time with Jazz EZX's Brush Delight preset. You can clearly hear the difference between the sticks and brushes: the snare, hi-hats and toms are much softer. Indeed, brushes don't work particularly well for this kind of groove, due to the compromised attack of their sound. Step 3: A drummer would probably approach a brushed groove like this by moving the ride off the hi-hat and onto the snare. We've switched from regular eighth-notes to sets of three 16th-notes, and shifted the main beats to a rimshot articulation. This introduces sonic continuity between the riding pattern and the backbeat. Step 4: Ultimately, brushes are primarily intended for playing swung jazz grooves on the snare drum, the right hand tapping out the ride pattern and the left playing the characteristic breathy swirls for which they're best known. Here's the right hand, accompanied by a pedalled hi-hat on beats 2 and 4. Step 5: Jazz EZX's 'half circle' articulation samples the sound of a brush being dragged around the circumference of the snare head. Placing one every other beat instantly invokes that smoky jazz club vibe. EZdrummer can only trigger one snare sound at a time, however, so we have to offset the swirls from the main hits. Step 6: Jazz EZX also features a fast 'full circle' brush swirl articulation, which is ideal for filling shorter gaps between main hits. 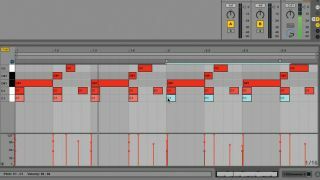 Here's our final pattern, complete with a very quiet kick drum on every beat. Hear how the swirls work rhythmically around the main snare hits rather than getting in their way. Nice.